This is one of the bigger woodcuts, 32"x20". It took me about a month and 1/2 to cut it. It's called "The Quaker Oak". It's the Quaker Meeting House in Cornwall, NY, and, of course the oak tree in front of it. 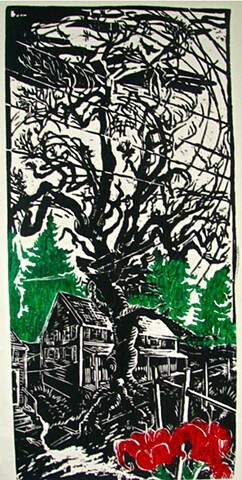 I drove by it many times and admired the tree, but didn't think to do a woodcut of it until I realized I could call it "The Quaker Oak", which made me laugh (get it?). So even though it's pretty gothic, and, as always, inspired by the Romantic art of Delacroix, etc, sometimes it takes a little silly humor to spark the "inspiration flint"